59355-RB-PK is rated 3.7 out of 5 by 3. 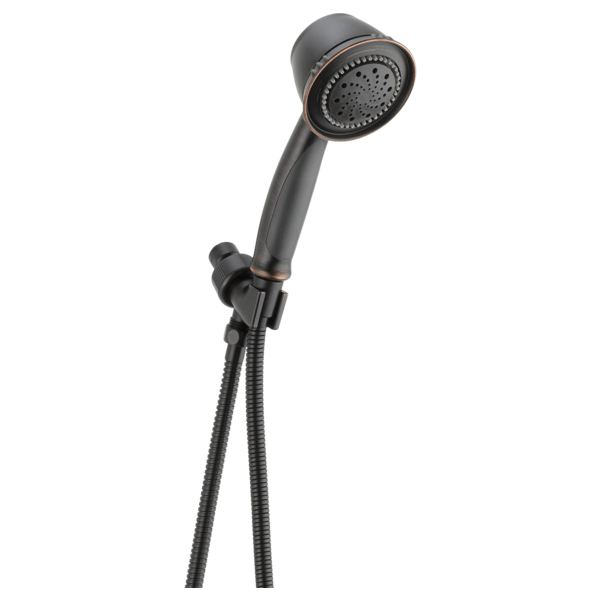 Rated 5 out of 5 by Phil from Excellent shower system My old shower had plastic fittings and kept cracking, this one has brass connections and seem to be much better made. I also like the sprayers settings and much improved hose. Rated 1 out of 5 by robert from Cheap I would not recommend this product. It was difficult to get it to seal properly. The "massage" feature is pretty poor. Rated 5 out of 5 by Nick from Delta Hand Shower We bought this thinking it was the same as our old one. It appeared to be in the picture. But, though they look the same, this one is much better than the one we had. It has a new type of hose on it that makes it very easy to use. It is light and very easy to handle. We are happy. Thank you. Does the Cradle that holds the hand shower pivot? / Is there a ball of some sort allowing cradle to tilt up/down or right/left? If not, what would be a better option? Must attach to shower arm off wall. Can I install this on the Addison handshower bar? What is the difference between this and model #59515-SS ? What is the stainless hand held made of metal or plastic? what parts do I need for repair and where are new parts least expensive? 1. Need to replace shower arm mount. But also want to add 2. a 3 way shower arm diverter to keep a fixed shower head as an option as well as the option of using the hand-held from 3. a wall mount or 4. slide pole mount depending on the cost. 5. Also need to replace corroded shower arm and flange and having a hard time finding them in polished brass. Is there a replacement part for the shower mount? My shower mount has a fine split in it. It will spray a mist of water onto the wall for about the first minute after the water is turned on. I can't find my receipt for the shower (purchased at Lowe's) and I'm having trouble finding the replacement part.